Volkswagen’s history is actually quite simple. Käfer was conceived before the WW2. It was meant to become the car for the masses. Cheap, practical and a genuinely good way to travel – Käfer was bound to be a huge hit. However, the WW2 changed these plans dramatically. Instead of mass production of the new car, entire industry was employed to manufacture guns and military vehicles. And so instead of the Käfer the world saw a military off-roader Kübelwagen and an amphibian version of it named Schwimmwagen. However, once the war was over, Käfer was pushed into production and onto its global success. But there was another special little Volkswagen that helped making these little Beetles. 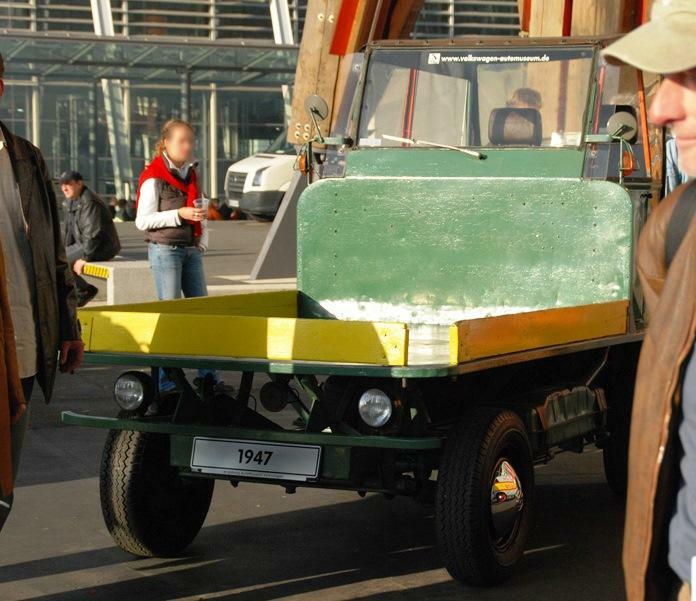 Meet the Plattenwagen – Käfer-based light truck. You have probably never seen one, because it was actually never sold to general public. 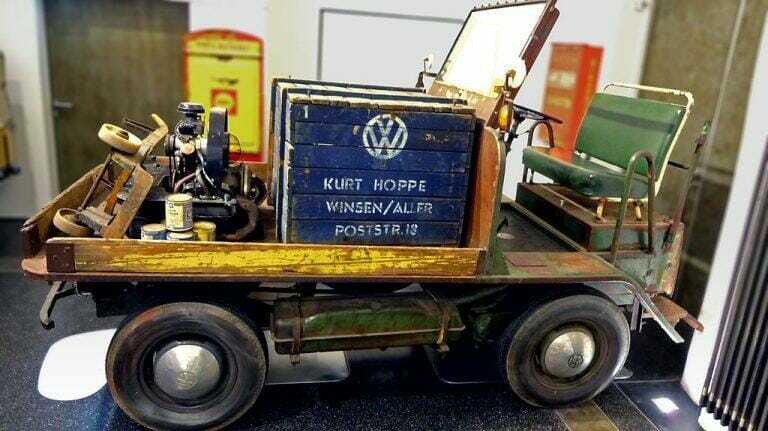 Volkswagen built the Plattenwagen for itself – it was meant to distribute various parts inside the factory. And that’s what it did – workers would load heavy engines, transmissions and other car components into its front loadbed and the Plattenwagen would be on its way to the other end of the factory where these parts would be installed. Because of how utilitarian and primitive the Plattenwagen was no one even though of making them for sale – who needs a bizarre backwards pickup truck thing? But for Volkswagen factory in Wolfsburg it was a very useful tool. Plattenwagen was based on Käfer’s platform, but featured a somewhat weird layout. Its open cabin was situated right above the air-cooled engine. It had two separate seats or one bench. Just like the Käfer, Plattenwagen was rear-wheel-drive and had a simple manual gearbox. Its frame was a bit stronger than Käfer’s – it was constructed from heavy steel pipes, which were strong enough to support a huge load of cargo in the front. Plattenwagen’s wheels were significantly larger as well and between the axles there was a big fuel tank. Even though Plattenwagen was not intended to be driven on public roads, it had a proper windshield wiper, headlights and side mirrors. In fact, some Plattenwagens even had a fully enclosed cabin protecting drivers from the rain, but the list of comfort features pretty much stopped there. The loadbed had simple wooden sideboards meant to prevent things from sliding and falling on the ground. For what it was Plattenwagen was quite quick and manoeuvrable. In fact, when a Dutch importer of Volkswagen cars Ben Pon visited the Wolfsburg factory in 1947 he immediately got inspired by Plattenwagen’s performance. He quickly sketched a new commercial vehicle, which could benefit not only Volkswagen’s factories, but also farmers and small businesses across the world. This simple sketch was the beginning of the history of the Type 2. Volkswagen’s commercial vehicle division now is very strong, offering its customers extremely high-quality products. And now you know that the beginning of its history was the humble Plattenwagen, which was special enough to become an inspiration for one of the most iconic cars ever. What is this tractor doing in the middle of a flower field? We use words without paying much attention to them. For example, words “semi-truck” are used commonly, but how many people know what that means? What is “semi” about these machines? There are actually two possible explanations. 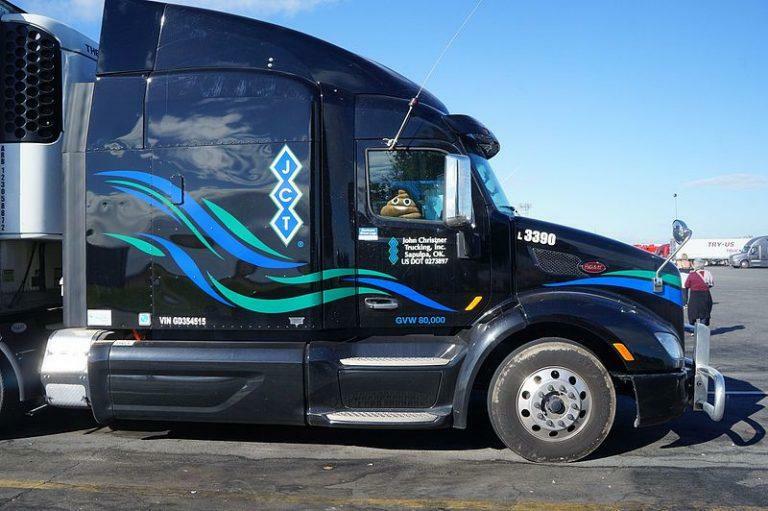 In US and some other countries semi-trucks are simply referred to as Semi’s. It is a name everyone understands and once you mention a semi-truck everyone has an image in their heads of an articulated vehicle, consisting of a tractor unit and a trailer. Actually, the trailer is part of the story why semi-trucks are called like that. Semi-trucks are, most of the time, hauling semi-trailers. A simple trailer is a wheeled platform, which can stand on its own on its wheels without any support. Meanwhile semi-trailers only have wheels at one end of the platform. The other end relies on the chassis of the semi-truck for support when driving. It cannot stand by itself on its wheels – it needs extendable legs or some other type of support structure. Semi-trailers cannot be hauled by anything else – they need an appropriate semi-truck to move. Even if you took the most powerful agricultural tractor, you could not safely pull a semi-trailer, because the front of it doesn’t have wheels and needs a chassis to rest on when travelling. But that is just a part of the explanation. 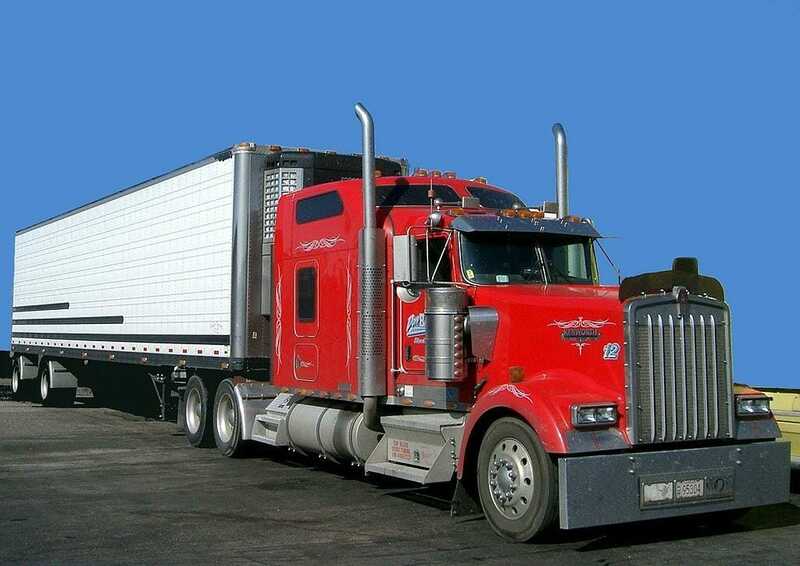 Semi-truck is a combination of a semi-trailer and a tractor unit. Not that difficult to understand and it totally makes sense. But there is another explanation for where did this name come from. The hitch mechanism at the back of the semi-truck is commonly called a “fifth wheel”. There are two most common types of fifth-wheels: semi-oscillating and fully-oscillating. 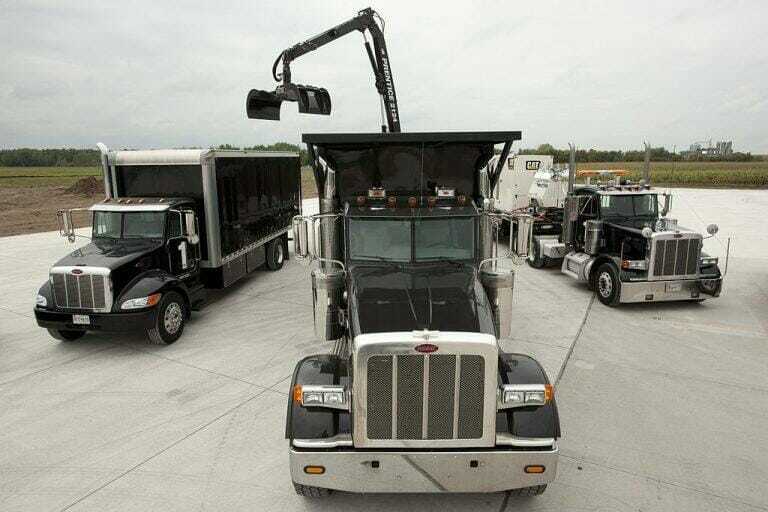 Most semi-trucks feature a semi-oscillating hitch (turntable hitch or fifth wheel – whatever you want to call it). It means that the hitch mechanism is not entirely rigid – it tilts slightly from front to back. Imagine that the rear of the semi-trailer gets a little bouncy and starts moving up and down. The fifth-wheel will accommodate that movement, making the entire truck more stable. But if the trailer is tilting sideways, the semi-oscillating hitch will not move with it – a semi-oscillating hitch does not tilt from side to side. It is not usually a problem, though, because semi-trailers typically have enough flexibility in their chassis to absorb lateral movement without disturbing the balance of the tractor unit. However, in some situations a fully-oscillating hitch has to be used. 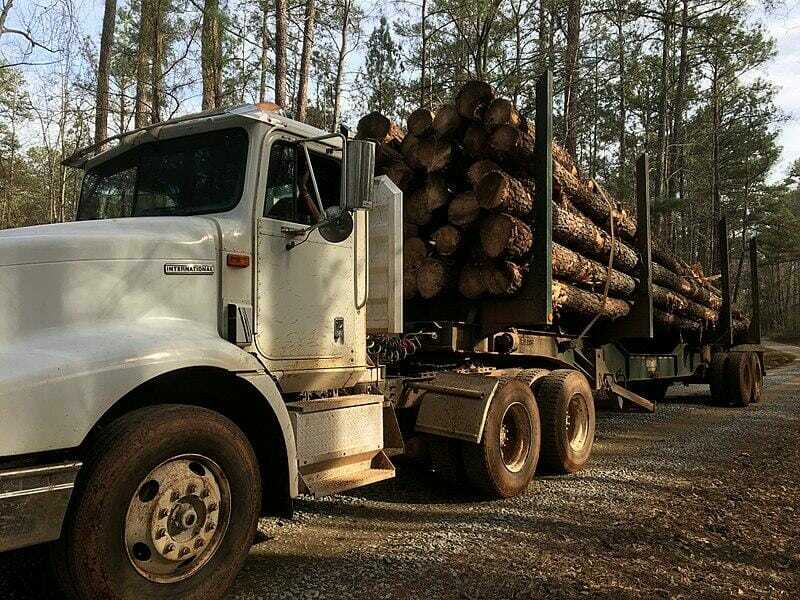 For example, in forestry semi-trucks. Because the terrain is so uneven, semi-trailers get rocked quite a lot. A fully-oscillating hitch tilts from side to side and thus allows for more movement in the trailer without disturbing the truck. This is also beneficial when the semi-trailer is very rigid (for example, when it is a tanker). However, fully-oscillating fifth-wheels are more complex, more expensive and typically unnecessary, which makes them pretty rare. That could be why semi-truck name stuck. The reason why semi-trucks are called this name is probably combination of both of these theories. You should remember that a typical semi-truck is an articulated vehicle, consisting of a tractor unit and a semi-trailer, connected through a semi-oscillating hitch. Posted in Technology and ScienceTagged trucksLeave a Comment on Why semi-trucks are called like that? What is so “semi” about them? 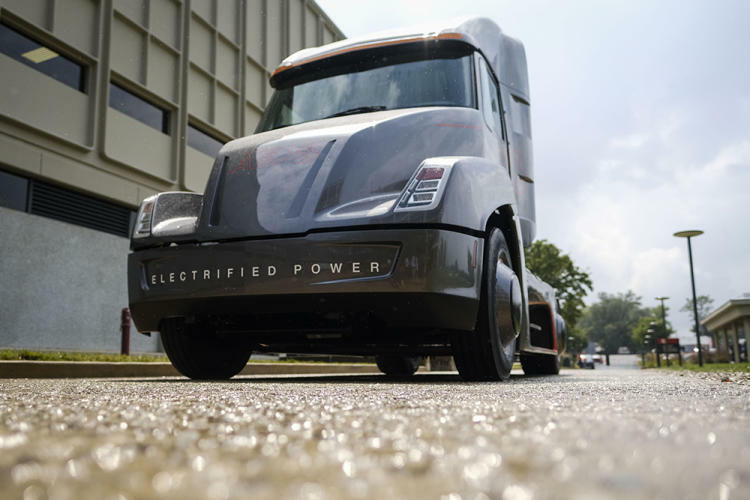 Truck electrification is beginning to reach its stride. Companies are in some sort of a race, which will result in a lot of new electric trucks being introduced next year. You‘ve heard of Tesla Semi, Cummins Aeos, Daimler and maybe even Volvo‘s plans to introduce new electric trucks in 2019. And now Renault is joining the crowd. It would be easy to think that Tesla started this trend with its Semi – a super fast and efficient semi-truck, which can reach 97 km/h in just 20 seconds while pulling a heavy load. 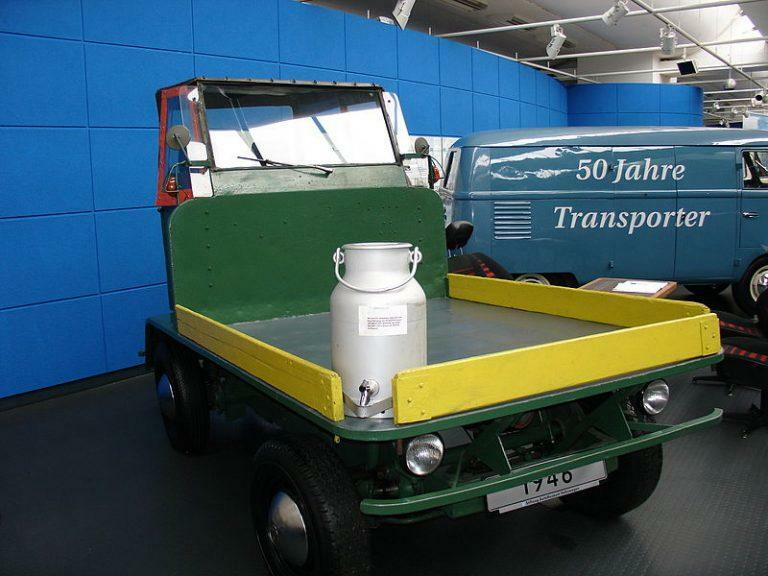 However, this impressive machine was not the first electric truck to be announced. For example, Daimler has been experimenting with electric technology in its trucks for quite some time already. The main focus of Daimler is different than the one Tesla. Daimler is looking forward to introduce electric urban delivery trucks, which are smaller and typically travel smaller distances every day. Cummins had a similar idea when it introduced its Aeos – a day cab semi-truck with a range of around 160 km. It seems that this trend is here to stay. Numerous manufacturers proved that electric heavy duty trucks are actually possible. Furthermore, they can be relatively affordable and easy to live with. If everything works as expected, Tesla Semi might actually be one of the most reliable semi-trucks in the market. Meanwhile big current manufacturers were not so vocal about their plans to start production of electric trucks. Have you heard about electric trucks from Scania, MAN, Peterbilt and other giants of the truck industry? No. 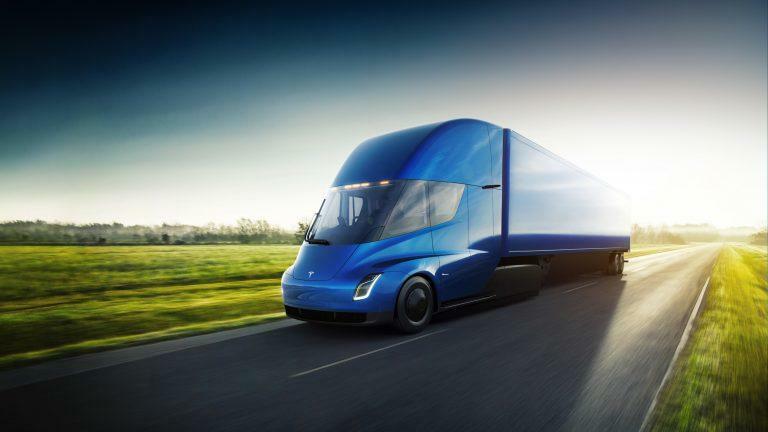 While there are certainly some plans, they are not developed to the stage of Tesla Semi or Cummins Aeos or even Nikola One. This new segment is up for grabs for the new players. However, some interesting projects are already coming from the well-known truck manufacturers. 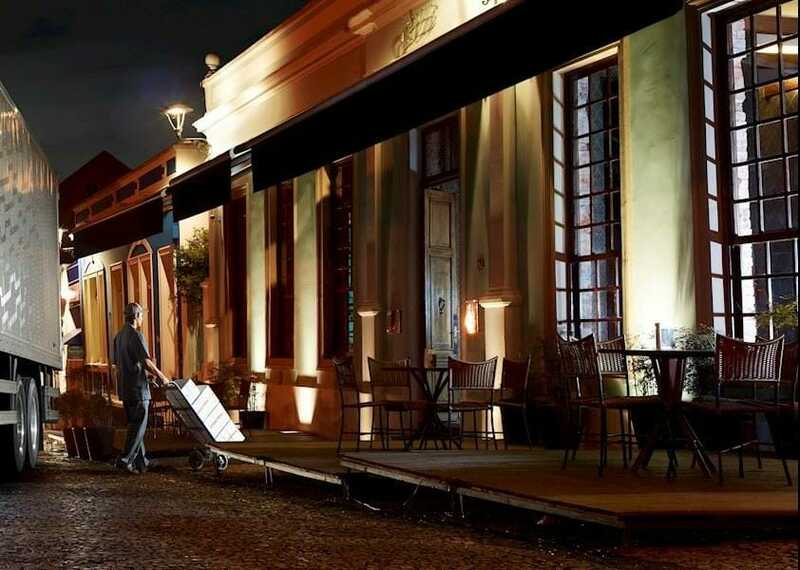 Volvo Trucks has announced that it will introduce an electric urban distribution truck in 2019. While long haul machines are certainly in the plans, Volvo believes that city operations is where the electric trucks could thrive. In fact, Volvo said that electric urban distribution trucks could even work at night, helping to reduce city noise and congestion. And now finally we heard from Renault. 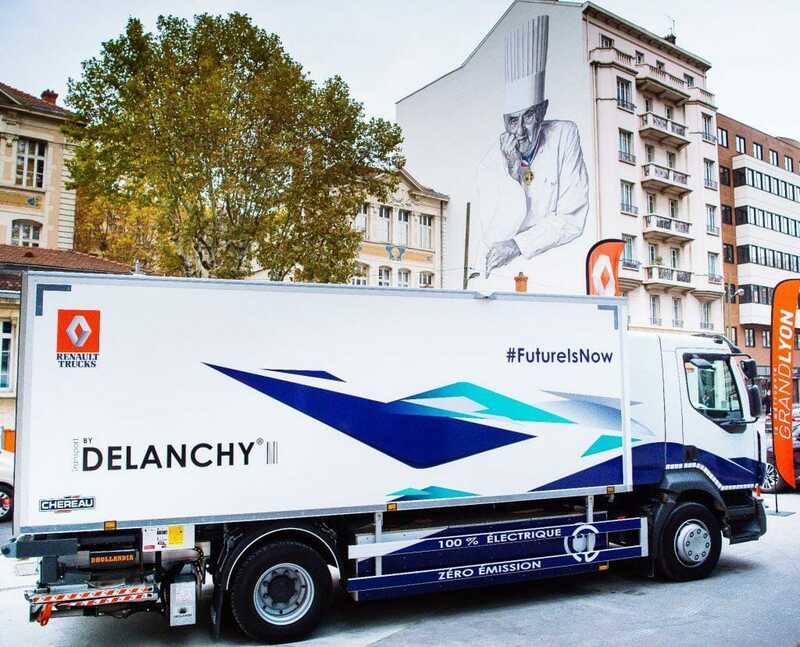 Renault Trucks has just announced that it will launch a new electric truck range in 2019. Pretty much at the same time when many other companies are going to introduce their first electric trucks – it is going to be an interesting year. However, Renault is not just following current trends. This company has been experimenting with electric technology since 2009, so it is about time to introduce some products into the market. For now the range will consist of urban and peri-urban delivery trucks. They are unlikely to feature such an extreme design like Tesla Semi or Nikola One. The reason is that smaller trucks do not have such big cabins, so there is not much room for extravagant design opportunities. However, we do expect some rounded corners, lack of big grill and some interesting paint schemes. So let’s see what we have. Daimler is preparing electric urban delivery trucks for intercity operations, Volvo is focusing on urban delivery and Renault is going to do a little bit of both. None of the major truck manufacturers in this article are preparing big semi-trucks, not even with day cabs. What does that mean? It simply means that the old, trusted brands are letting new players to take on this market segment. They can jump on-board at any point they want, but for now they will just sit back and look how new manufacturers are going to do. Who knows, maybe smaller urban delivery trucks is actually a smarter step to this new age of electric trucking. 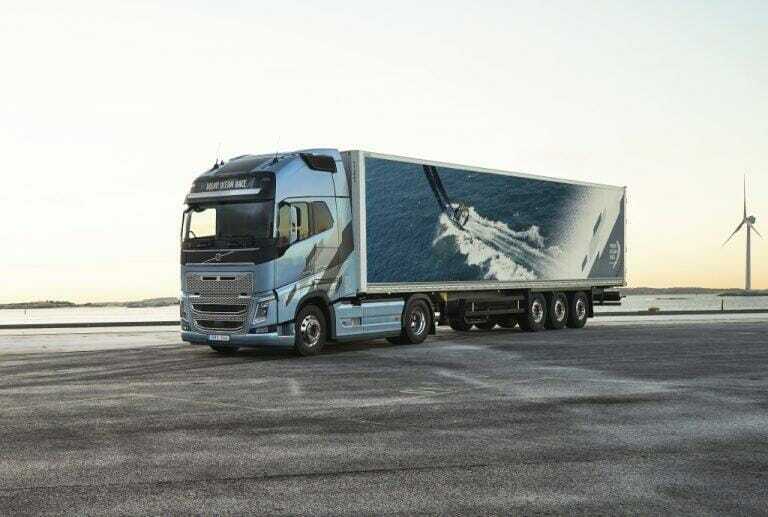 Posted in Technology and ScienceTagged Daimler, Renault, Tesla, trucks, VolvoLeave a Comment on Renault will begin selling electric trucks in 2019 – it is going to be an exciting year! Posted in Technology and ScienceTagged trucksLeave a Comment on Why semi-trucks in US and Europe are so different?